3% OOOO! Hey, that is a bit sore. Must be doing something good though. 2 % Holy cr#p, that hurts!!!!!!!!!!! Stop! STOP! The pain!! Oh, the pain!! In a recent census (By me. Of my Friends and Relations), it seems we are divided into Foot SqueezyPhiles and Foot SqueezyPhobes. But (and there is a 'but'), for the Unitiated, there is something you need to know. Those ladies (& men, actually) with their penetrating fingers and relentless knuckles of reinforced steel are capable of seeking out the teeniest tiniest point of Ouchy, wherever it might try and hide itself. The bit at the base of your big toe nail? Gotcha. The tendony bit under the arch of your foot. FOUND you. Those bits, under your toes, where the balls of your feet start to become your toes. There's nowhere to hide, Ouchy. Come out with your hands up, Ouchy bit. You might as well give up, because she is going to keep at you till you melt away into smooth non-ouchy grooviness. Just so long as I can stop flinching, and refrain from crying. It was busy in there today. 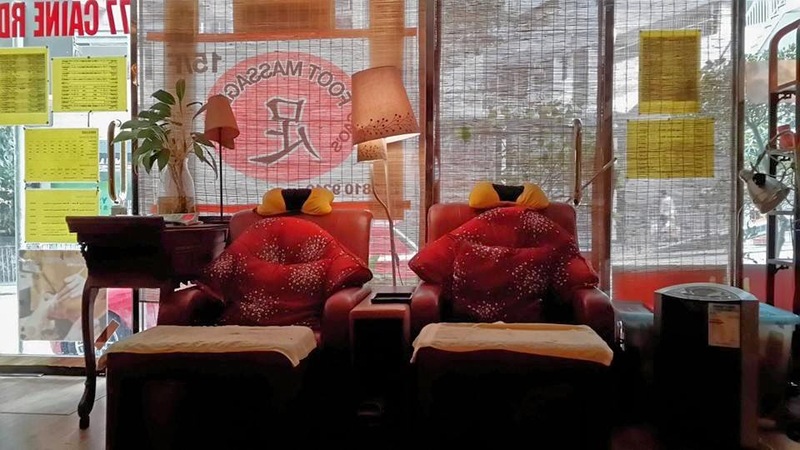 6 out of the 7 seats were occupied with people at various stages in their massage. A real mix of people today. Young(ish) people in flipflops (it is a Public Holiday, Easter Sunday, in fact). Late middle-aged Chinese Business Man hung his suit jacket up and measuredly removed his work socks and shoes before settling in for the Ahhhhhhhhhhhhhhhhh. (unfortunately it seems he blotted his copy book by, at some point before I arrived, conducting a number of very loud 'business' phone conversation. The Food Squeezing Team did not approve. We were all there. Together, next to each other. I can only imagine that 10 years in the Middle East has played havoc with my Factory Settings as, I was shocked to notice that I had even noticed the fact that Men & Women were seated (& being Squeezed) side-by-side. AND that the Squeezers doing the Squeezing were Men & Women. No reason why they shouldn't be. I just noticed that I had noticed. 11 years ago, I wouldn't have. So tranquil, in the Palace of Foot Squeezing. There are no shortage of such places, all over HongKong. Crammed into the tiniest of spaces, so practical and yet, a haven. A decadent luxury with an air of practicality, which helps One feel a bit less frivolous indulging in this bliss. Outside, double-deckers & mini-buses whoosh and grind their way passed the front window. the sheerest of bamboo blinds separate the Outside World from us in here. The Inter-Foot-Squeezers banter is cheerful & slightly ribald (handy thing, this not looking like they expect you to understand the lingo). Birds tweet, hypnotically (CD volume at exactly the right level). 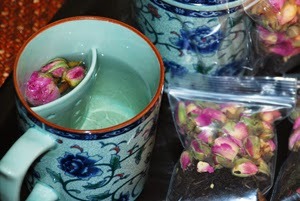 The Rose Bud Tea (or water) feels cleansing and refreshing. The hot scented towels wrapped round my feet, enough to induce a coma. My idea of Hell. Well, one of my ideas of Hell, I have several.